Online ordering menu for TOP BOP Midtown. What is Top Bop? The place for amazing Asian fusion cuisine served over delicious Korean mixed rice. Try our taste sensations such as bibim bop, Bulgoggi Bop, and Poke Bop--all are made with nutritious fresh vegetables and premium protein selections. You'll also love our pot stickers top with a homemade sauce! 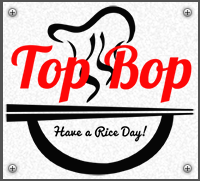 Top Bop is located near the corner of W. Benson Blvd. and Minnesota Dr., in the Choi's 1 Shopping Center, just east of Aquarian Charter School. Top Bop, your top choice for a quick, delicious lunch or dinner. Order online today and Have a Rice Day!